CombatCasuals.com, LLC is owned and operated by veterans of the United States Army, and has its Principal Place of Business located in the state of Colorado. Our Contact Details: ( NOT returns, see Returns Policy for return address). Email: Please use our Online Inquiry System by clicking here. In general, our embroidered emblems are no larger than 3" x 3", and most are smaller than that. They are placed on the upper left breast area (except with some children's and women's items, where they are placed in the center). They are not patches -- they are directly embroidered onto the clothing or accessory article. The size is intended to create a tasteful look for the professional who wishes to display their unit pride, their military accomplishments, etc. CombatCasuals.com, LLC is completely dedicated to your total satisfaction. If you have any suggestions or comments please click here to email us. * If your emblem consists of silver thread representing Airborne Wings, Air Assault Wings, HALO Wings, etc. and there is no white thread in the emblem at all, the text will be done in silver thread to match the Wings. If your emblem consists of silver thread representing Airborne Wings, Air Assault Wings, HALO Wings, etc. and there IS white thread in the emblem (for instance a blue/white Airborne Tab, etc. ), the text will be done in white thread as in the "typical" Full Color Emblem. Recap: Dark garment, Full Color Emblem, and there is no White at all in Emblem, the text will be silver. Dark garment, Full Color Emblem, and the emblem has White incorporated in it, the text will be white. Typically black, navy, forest green, burgundy, royal, maroon, emerald green, etc. garments are considered "dark" garments. Typically white, ash, heather grey, sports grey, light steel, sand, pebble, tan, red, sage green, gold, pink, stonewashed green, envy green, etc. garments are considered "light" garments. Note that one emblem on the web site has gold lettering incorporated into the full color version: the "Nous Defions" series of emblems. This "Nous Defions" full color lettering will always be gold unless the order is for a yellow or gold garment. In that case, the lettering will be black. There are a few emblems that have text integrated into the emblem itself: i.e. Special Forces Branch Insignia with Group Number. The photos on the web site are for reference only for these emblems. Be advised that the text color guidelines as mentioned above will apply for the Group Number as well as the writing option for beneath emblem. There are also Special Forces Crests that have a large numeral incorporated. Be advised that these numerals will be as noted in the graphic and any optional writing beneath emblem will follow the guidelines. At all times the overall appearance of the garment is considered when choosing colors for the script option. There are a few garments that have contrasting colors on certain components i.e. straps on the rear of a cap, etc. If the text on the garment would look better if it matched that contrasting color, we will choose it for the best overall appearance. Making a purchase could not be easier. Just browse our on-line catalog, and click on any items that you wish to buy. Then, select an emblem, and possibly a script option for below the emblem, and put them into the shopping cart. After you have finished your selection, click on "Checkout" and you will be asked for a few details that we need to be able to satisfy the order. We accept Visa/Mastercard credit card payment only from United States banks. If you are shopping from North America, place your order and use your credit or debit card with affixed VISA or MASTERCARD logo. WE ONLY SHIP INSIDE THE CONTINENTAL UNITED STATES, ALASKA and HAWAII. Foreign shipments are reserved for active duty personnel who give us the proper APO/AE/FPO address to ship to, and who select this "APO/AE" option at the checkout to incur the proper shipping charges. We charge when the item is purchased, as all of our merchandise is hand made to order, and we use a secure (SSL) third party credit/debit card processing service. If for some reason you cannot get your card to work on our site, we can do regular mail-in orders using checks or money orders drawn on U.S. based banks and in U.S. dollars.. You must be pre-approved before doing this, as some items cannot be done via mail-in. Contact us for details. If you are planning a large order (perhaps for a unit fund-raiser or the like), we may be able to grant a discount. We ENCOURAGE large orders, and we will work to get you a fair price. So e-mail us today to talk about your large order requirements. Your order is processed (not manufactured) within 48 hours after we receive it. However, because all of our products are finished by hand (embroidery is an art, and they are not pre-made) it will take about 2-3 weeks to ship your order. We strive to ship within 2 weeks. Larger orders may take longer, depending on supply. Backorders: There are no backorders. If we do not hear from you within 21 days, we will automatically refund your money for that item (shipping and taxes, if applicable, will be refunded for orders where the entire order cannot be filled.) and again notify you of our action. We ship via UPS Ground service, and will only use U.S. Priority Mail to APO/AE/FPO shipments, (as UPS does not ship to APO's) Alaska and Hawaii, and for patches-only shipments. There are no overnight or other special shipment options. If shipping to a MILITARY ADDRESS: You MUST enter appropriate shipping information if you are ordering from a military base, i.e., we need your street address, not just your unit address. UPS is decent at determining unit addresses, but enter ALL information about your package destination as you can to make sure this process goes smoothly. APO/AE/FPO's: You must choose (check) the proper APO/AE selection on the shipping information page. If you do not do this correctly, you are subject to being charged the extra amount (the difference) that it costs us to ship to APO/FPO's. Be advised: Combat Casuals.com, LLC takes no responsibility for lost, not-received, or otherwise improperly delivered shipments to APO/AE/FPO's as they cannot be tracked once they are received by the government. We do retain copies of receipts of shipment from the U.S. Postal service for all APO/AE/FPO shipments. 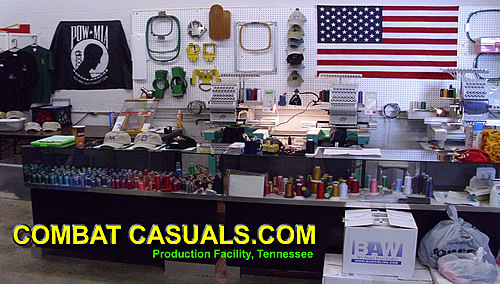 CombatCasuals.com, LLC's products are finished by hand, and custom made to order. THEY ARE NOT PRE-MADE. Therefore, we will strive to ship your order within 2 weeks, but it may take up to 3 weeks to ship your order. Holiday Season: Orders received between October 15th and January 1st are in the Holiday Season. We will strive to get your order out the door in 2-3 weeks, HOWEVER, as with most retailers during this season, we can get swamped with orders. Please be advised: Your order during this period may take 4 weeks to ship. We do not offer expedited shipping, no matter what the holiday or occasion. So please, plan in advance. Combat Casuals.com, LLC makes no guaranty, express or implied, that an order will be received at the shipping destination on a certain date, even ifall of the items purchased came from an expresscategory indicating a specific shipment time frame. Such express time frames indicate an order will be shipped within a certain time, not delivered within a certain time. For orders received from the state of Colorado, (i.e., the billing address is located within the state of Colorado) state sales tax will be applied to all in-state ( Colorado) orders. Our Principal Place of Business is located within the State of Colorado. We know of no documented cases of credit card fraud using our shopping system over the Internet. A SSL encryption method is employed. Cancellations: Orders may ONLY be cancelled within 24 hours of making the order. This means we must receive your cancellation e-mail (only) within 24 hours after making your purchase. No other cancellations are allowed. The 24 hours begins after you make your purchase, irrespective of business day or holiday/weekend day. If, after 24 hours from your purchase, we do not receive a cancellation e-mail from you, your order will be manufactured and you will not be refunded. There are no exceptions to this policy. All proper cancellations are subject to a 15% processing/restocking fee. Modifications: Generally, modifications to an existing order are not allowed. Combat Casuals.com, LLC reserves, at their sole discretion, the decision to allow an existing order (i.e., receipt of reserve authority or receipt of payment) to be modified. This is usually, but not always, contingent on whether the order item(s) have been arranged to be shipped to our factory in order to be finished. Other factors may imapct this decision, such as, but not limited to: quantity, complexity of modification, and other factors. ALL proper returns require a Return Authorization number (R.A.#), which may be obtained by e-mailing us. No full refund or in-store credit will be granted to any item sent back without a proper R.A.#., and will be subject to a minimum 15% restocking fee. Non-defective returns will receive in-store purchasing credits only. No cash refunds. We do NOT provide exchanges/returns for SIZE issues because all of our items are custom finished, i.e., custom embroidery work has been done on them by your request and the item may not or cannot be resold (unique). If you have questions about sizing, please inquire in advance of your order, and we will provide you with available industry sizing information according to the item contemplated. By ordering, you agree to assume the risk that the item may not be the size contemplated (except when an item ordered at a specific size is received as labeled at an incorrect size). Any exceptions to these rules are at Combat Casuals.com, LLC's sole discretion. Special Orders: Returns of items that Combat Casuals.com, LLC special orders from a manufacturer will not be allowed. In addition, this includes items not in the on-line catalog, special sizes, colors, custom script, custom emblem combinations or placement, etc., or unusually large quantities of on-line catalog items. Proper Returns are refunded ONLY IF they are received at our Return Address AS NEW, (i.e., Unused, Unwashed and Clean), within 15 Contiguous Days from delivery. No dirty or worn products will be refunded. You will only be refunded the cost of the item, and the tax if applicable, but NOT the shipping and handling. We will need your payment information (copy of invoice) to make the refund, so be sure to include this when shipping an item to be refunded. ALL RETURNS ARE SUBJECT TO A 15% PROCESSING/RESTOCKING FEE. This means your refund will be less 15% of the retail value of the item. Orders returned by a freight delivery carrier as refused, bad address, or any other reason without prior notification or authorization will be subject to a minimum 15-75% restocking fee at Combat Casuals.com, LLC's discretion. Combat Casuals.com, LLC, Lakewood, Colorado has its Principal Place of Business in the state of Colorado. The owners, publishers of this website, and anyone else whose information may be included on, or linked to this web site cannot attest to or endorse the safety of using any equipment, supplies, or services evaluated or referred to therein, and such shall at all times be used in accordance with any instructions provided by the manufacturer or supplier. By using this website and any products available through this website, you assume any and all such risks. Copyright (c) 2006 by Combat Casuals.Com, LLC. All text, graphics, audio files, Java applets and scripts, downloadable software, and other works on this web site are the copyrighted works of Combat Casuals.Com, LLC All Rights Reserved, or their partners, affiliates, and vendors. Any unauthorized redistribution or reproduction of any copyrighted materials on this web site is strictly prohibited. The following are the protected Trademarks of Combat Casuals.Com, LLC: "Combat Casuals". All rights reserved. Hyperlink Disclaimer: The Combat Casuals.Com, LLC site (www.combatcasuals.com) contains hyperlinks to other Internet sites not under the editorial control of Combat Casuals.Com, LLC. These hyperlinks are not express or implied endorsements or approvals by Combat Casuals.Com, LLC, of any products, services or information available from these sites. THE GOODS AND INFORMATION PROVIDED ON THIS WEB SITE IS/ARE PROVIDED ''AS IS'' AND ALL WARRANTIES, EXPRESS OR IMPLIED, ARE DISCLAIMED, INCLUDING, BUT NOT LIMITED TO, ANY IMPLIED WARRANTIES OF MERCHANTABILITY, MERCHANTABILITY OF ANY COMPUTER PROGRAM OR SOFTWARE, FITNESS FOR A PARTICULAR PURPOSE, ACCURACY OF INFORMATIONAL CONTENT, OR SYSTEM INTEGRATION, OR NON-INFRINGEMENT. COMBAT CASUALS.COM, LLC'S MAXIMUM LIABILITY FOR ANY INACCURATE INFORMATION OR SOFTWARE AND YOUR SOLE AND EXCLUSIVE REMEDY FOR ANY CAUSE WHATSOEVER, SHALL BE LIMITED TO THE AMOUNT PAID BY YOU FOR THE INFORMATION RECEIVED (IF ANY). COMBAT CASUALS.COM, LLC IS NOT LIABLE FOR ANY INDIRECT, SPECIAL, INCIDENTAL, LOSS OF BUSINESS, LOSS OF PROFITS OR CONSEQUENTIAL DAMAGES, WHETHER BASED ON BREACH OF CONTRACT, BREACH OF WARRANTY, TORT, NEGLIGENCE, PRODUCT LIABILITY OR OTHERWISE, EVEN IF ADVISED OF THE POSSIBILITY OF SUCH DAMAGE. 2. Collection and Use of Personal Information. Combat Casuals.Com, LLC may collect Personal Information when you use certain services on the Combat Casuals.Com, LLC web site or when you visit cookie-enabled web pages. Combat Casuals.Com, LLC may also log your IP address when you use the Combat Casuals.Com, LLC web site. Combat Casuals.Com, LLC uses this Personal Information to fulfill requests for our services or products, to contact users regarding changes to our site or our business, and to customize the content that you might see on the Combat Casuals.Com, LLC web site. Combat Casuals.Com, LLC may also use ''cookie'' files to better serve your needs by creating a customized web site which fits your needs. 3. Sharing and Disclosure of Personal Information. Combat Casuals.Com, LLC will not sell or rent your Personal Information to any individual, business, or government entity. Combat Casuals.Com, LLC will share your Personal Information with other entities should you request Combat Casuals.Com, LLC to share such information, or if Combat Casuals.Com, LLC is required to respond to court orders, subpoenas or other legal process. 4. User Accounts. Combat Casuals.Com, LLC allows users to set up personal accounts to shop in our on-line store. You have the ability to edit your User Information at any time, and may delete your account at your convenience. Under no condition will Combat Casuals.Com, LLC share your user account information with another individual, business or government entity, unless Combat Casuals.Com, LLC is required to respond to court orders, subpoenas or other legal process. 5. Encryption. All user account pages are protected with Secure Socket Layer (''SSL'') encryption. All user accounts must be accessed with usernames and passwords. You are advised not to share your username and password with any other person. 6. Amendments/Updates. Combat Casuals.Com, LLC reserves the right to amend this policy at any time. Combat Casuals.Com, LLC will contact registered users by e-mail, and shall also post a notice of changes on its web site, when and if the terms of this policy are amended. Combat Casuals.com, LLC, the owners, publishers of this website, and anyone else whose information may be included on, or linked to this web site have no duty to update this site or the content hereof and Combat Casuals.com, LLC, the owners, publishers of this website, and anyone else whose information may be included on, or linked to this web site shall not be liable for any failure to update such information. 2. On-line Services and Disclaimer of Warranty. The Combat Casuals.Com, LLC web site provides on-line resources including, but not limited to, on-line information regarding Combat Casuals.Com, LLC's products and information regarding various similar and other products and services that may or may not be sold at the Combat Casuals.com website. Any new services, resources or informational content added to the web site shall fall under the terms of this TOS Agreement. The on-line resources, informational content, and software on this web site is provided ''AS IS'', AND ALL WARRANTIES, EXPRESS OR IMPLIED, ARE DISCLAIMED, INCLUDING, BUT NOT LIMITED TO, ANY IMPLIED WARRANTIES OF MERCHANTABILITY, MERCHANTABILITY OF ANY COMPUTER PROGRAM OR SOFTWARE, FITNESS FOR A PARTICULAR PURPOSE, ACCURACY OF INFORMATIONAL CONTENT, OR SYSTEM INTEGRATION, OR NON-INFRINGEMENT. Combat Casuals.Com, LLC assumes no responsibility for any data loss or other loss suffered by any User of this web site. User is fully responsible for maintaining its computer equipment and Internet access to use the Combat Casuals.Com, LLC web site. 4. User account. Users will select a username and password upon completing the registration process. Users are fully responsible for maintaining the confidentiality of their username and password. User agrees to immediately notify Combat Casuals.Com, LLC should User know, or have reasonable grounds to suspect, that the username and password have been compromised. Combat Casuals.Com, LLC shall not be responsible for User's failure to abide by this Paragraph. 5. Informational content supplied by Users. User understands that all information, computer files, software, graphics, sound files, and text, whether publicly displayed by User on the Combat Casuals.Com, LLC web site, or privately transmitted through the Combat Casuals.Com, LLC web site, are the responsibility of the User from which such informational content has originated. User is fully responsible for any and all informational content that user uploads, posts, e-mails, or transmits using the Combat Casuals.Com, LLC web site. Combat Casuals.Com, LLC does not and cannot control the informational content Users transmit through the Combat Casuals.Com, LLC web site. Under no circumstances shall Combat Casuals.Com, LLC be held liable for User's exposure to informational content that User deems offensive, indecent or objectionable. Under no circumstances shall Combat Casuals.Com, LLC be held liable for any errors or omissions in any informational content transmitted by Users. Combat Casuals.Com, LLC does not pre-screen uploaded, posted or transmitted content, but Combat Casuals.Com, LLC reserves the right to inspect, edit and delete any content that Combat Casuals.Com, LLCs knows, or has reason to know, has violated this TOS Agreement. Combat Casuals.Com, LLC reserves the right to immediately, and without notice, terminate the account of any User found to have violated the provisions of this TOS Agreement. Combat Casuals.Com, LLC may disclose any informational content Users post, upload or transmit to the Combat Casuals.Com, LLC web site, if such disclosure is necessary to enforce this TOS Agreement, to respond to claims of intellectual property infringement, to comply with legal process, or to protect the rights of Combat Casuals.Com, LLC, the public, or other Users. 7. Content submitted by Users. Combat Casuals.Com, LLC does not claim ownership of any informational content submitted by Users to the Combat Casuals.Com, LLC web site. User grants Combat Casuals.Com, LLC a non-exclusive, royalty free license to use, distribute, reproduce, modify, and publicly display any informational content submitted to the Combat Casuals.Com, LLC web site. This license exists only so long as User allows its content to remain on the Combat Casuals.Com, LLC web site and will terminate in the event that User removes such content. Information delivered to the Sites (whether via posting, electronic mail, or otherwise) should not be considered by you to be confidential, and Combat Casuals.com, LLC shall not be responsible to keep such information confidential, and Combat Casuals.com, LLC shall not be liable for any use or disclosure thereof. All such information is, and shall remain, the sole and exclusive property of Combat Casuals.com, LLC and may be used by Combat Casuals.com, LLC for any purpose whatsoever, commercial or otherwise, without compensation. Combat Casuals.com, LLC welcomes your comments on our offered products, but Combat Casuals.com, LLC is not seeking any unsolicited ideas, suggestions, or materials relating to the development, design, manufacture or marketing of the products we sell. 8. Indemnity. You agree to indemnify and hold Combat Casuals.Com, LLC, and its subsidiaries, affiliates, officers, agents, co-branders or other partners, and employees, harmless from any claim or demand, including reasonable attorneys' fees, made by any third party due to or arising out of content you submit, post, transmit or make available through the Service, your use of the Service, your connection to the Service, your violation of the TOS, or your violation of any rights of another. 9. No resale. User agrees not to reproduce, copy, duplicate, or sell any portion of the Combat Casuals.Com, LLC web site. 10. Limits and modifications. Combat Casuals.Com, LLC may establish without notice limits on the use of its web site, including the maximum number of times Users may post to or participate in any present or future on-line communities, or to the number of times Users may access the Combat Casuals.Com, LLC web site. Combat Casuals.Com, LLC reserves the right to modify any and all portions of the Combat Casuals.Com, LLC web site without notice. Under no circumstances shall Combat Casuals.Com, LLC be liable to User or any other party for such limits or modifications. 11. Termination of User account. Combat Casuals.Com, LLC may, at its sole discretion, terminate the User's account for any reason. Under no circumstances shall Combat Casuals.Com, LLC be liable to User or any other party for such termination of User's account. 12. Third party advertisers. Combat Casuals.Com, LLC may allow third party advertisers to advertise on the Combat Casuals.Com, LLC web site. Combat Casuals.Com, LLC takes no responsibility for User's dealings with, including any on-line or other purchases from, any third party advertisers. Combat Casuals.Com, LLC shall not be liable for any loss or damage incurred by User in its dealings with third party advertisers. 13. Hyperlink policy. The Combat Casuals.Com, LLC site contains hyperlinks to other Internet sites not under the editorial control of Combat Casuals.Com, LLC These hyperlinks are not express or implied endorsements or approvals by Combat Casuals.Com, LLC, of any products, services or information available from these sites. 14. Combat Casuals.Com, LLC's intellectual property rights. User agrees not to distribute, license, or create derivative works from any of Combat Casuals.Com, LLC's copyrighted or trademarked material, including graphic files and software, available on the Combat Casuals.Com, LLC web site. 15. No warranties. THE INFORMATION AND ANY DOWNLOADABLE SOFTWARE PROVIDED ON THIS WEB SITE IS PROVIDED ''AS IS'' AND ALL WARRANTIES, EXPRESS OR IMPLIED, ARE DISCLAIMED, INCLUDING, BUT NOT LIMITED TO, ANY IMPLIED WARRANTIES OF MERCHANTABILITY, MERCHANTABILITY OF ANY COMPUTER PROGRAM OR SOFTWARE, FITNESS FOR A PARTICULAR PURPOSE, ACCURACY OF INFORMATIONAL CONTENT, OR SYSTEM INTEGRATION, OR NON-INFRINGEMENT. 16. Limitation of liability. COMBAT CASUALS.COM, LLC'S MAXIMUM LIABILITY FOR ANY INACCURATE INFORMATION OR SOFTWARE AND YOUR SOLE AND EXCLUSIVE REMEDY FOR ANY CAUSE WHATSOEVER, SHALL BE LIMITED TO THE AMOUNT PAID BY YOU FOR THE INFORMATION RECEIVED (IF ANY). COMBAT CASUALS.COM, LLC IS NOT LIABLE FOR ANY INDIRECT, SPECIAL, INCIDENTAL, LOSS OF BUSINESS, LOSS OF PROFITS OR CONSEQUENTIAL DAMAGES, WHETHER BASED ON BREACH OF CONTRACT, BREACH OF WARRANTY, TORT, NEGLIGENCE, PRODUCT LIABILITY OR OTHERWISE, EVEN IF ADVISED OF THE POSSIBILITY OF SUCH DAMAGE. SOME JURISDICTIONS DO NOT ALLOW THE EXCLUSION OF CERTAIN WARRANTIES OR THE LIMITATION OR EXCLUSION OF LIABILITY FOR INCIDENTAL OR CONSEQUENTIAL DAMAGES. ACCORDINGLY, SOME OF THE LIMITATIONS OF THIS PARAGRAPH MAY NOT APPLY TO YOU. 17. Notice. Notices may be posted to the Combat Casuals.Com, LLC web site or e-mailed to Users using the e-mail address Users submitted during the registration process. 18. General. This TOS Agreement constitutes the entire agreement between you and Combat Casuals.Com, LLC and governs your use of the Combat Casuals.Com, LLC web site. This TOS Agreement shall be governed by the laws of the State of Colorado. User agrees to submit to the personal and exclusive jurisdiction of the courts located within the State of Colorado. The failure of Combat Casuals.Com, LLC to exercise or enforce any right or provision of the TOS shall not constitute a waiver of such right or provision. If any provision of this TOS Agreement is found by a court of competent jurisdiction to be invalid, the parties nevertheless agree that the court should endeavor to give effect to the parties' intentions as reflected in the provision, and the other provisions of the TOS Agreement remain in full force and effect. Any claim arising under the terms of this TOS Agreement must be brought within one (1) year after such claim or cause of action arose or be forever barred. 19. Products Displayed. All products are subject to change. Combat Casuals.com and its suppliers and vendors reserve the right to add, replace, or withdraw items at ours and their discretion.